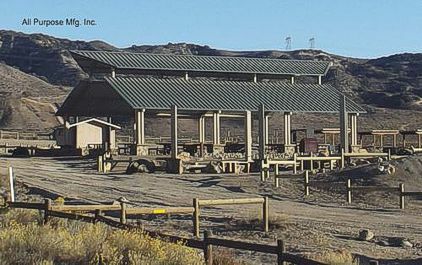 Ramada Park Shelter 18ft x 40ft long and 40ft x 80ft Metal Roof designed and manufactured by APMFG Fab. Inc.engineered for California. All Domestic Made in America Steel was used and by APMFG Fab. Inc. located in Oceanside, Califronia. The beautiful features of your traditional Country barn style. The Picnic Ramada blends in with the natural background of the mountains along with the Rust powder coated color to help match the earth suroundings. Shade Structure grand inside area is great for picnic tables to be protected by the weather while having an enjoying lunch or game. Solar LED Lighting is capable of being used to illuminate the shade structure during the night. 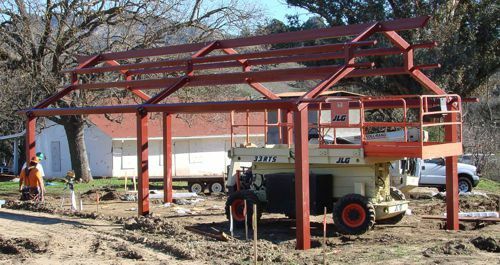 Shade Structure was designed and engineered to California's Steel Building Codes with heavy structural steel tubing. Welded together by certified welders, inspection and procedures per AWS. Bolted connection no field welding required. Sand Blasted Zinc Rich Primer with secondary Rust Powder Coat Color. Bus Shelter Hip Peak designs are manufactured and engineered to last with various roofing materials such as Aluminum roof skin, thermoclear twin wall polycarbonate translucent material, Maxi-Tile ceramic spanish tile, Met-Tile metal stamped shingle, Metal Standing Seam warranty up to 20 years.Bus Shelter Roofs are manufacture in Aluminum or Steel. The vertical frames can also be manufactured in all aluminum or steel and the back and sides to protect the patrons from the elements perforated metal, polycarbonate lexan and tempered safety glass. Most bus shelters can be surface mounted depending on the windloads. All shelters start at 9 foot long and can be designed up to 21 foot long. Solar LED Lighting is also designed and manufactured by All Purpose Mfg. Inc.